And judging from the very positive reaction of viewers on social media (he even trended on Twitter), it looks like they really missed him so much since he unceremoniously left last March and they now appreciate his return to the number one noontime show. Paolo says he learned so much from the experience. “Unang-una, natutuhan kong huwag magmaldita,” he says. “And that it’s true na everything happens for a reason. While I’m away from ‘Eat Bulaga’, I had time to do two new movies, ‘Die Beautiful’ for IdeaFirst Company and ‘Bakit Lahat ng Guwapo May Boyfriend” for Viva, both directed by Jun Lana who, I can say, brings out the best in me. Tapos yung ginagawa kong make up transformations ng iba’t ibang artista, lalo na ‘Game of Thrones’ stars, napansin pati sa ibang bansa and it’s now opening doors for me for a reality show. Nothing’s definite yet, pero nakaka-excite, kaya matuloy sana at, malay natin, baka magkaroon ako ng international career, kung susuwertihin. Habang wala ako sa ‘Eat Bulaga’, na-supervise ko rin pala ang construction ng isang bagong bahay ko sa Antipolo. 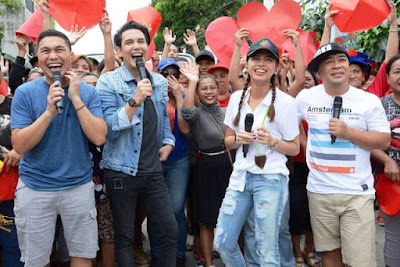 It’s just too bad that when Paolo returned, the Kalyeserye in “Eat Bulaga” has just ended and his fans wanted so much to see him again as the beautiful and glamorous Lola Tidora of Maine Mendoza. As of now, he’s just helping out host the “All for Juan, Juan for All” segment.